June 28 marks the anniversary of the First Battle of Kosovo in 1389, in which Serbia was defeated by the Ottoman Turks (the Sultan was, however, assassinated in his tent) and although Serbia did not truly lose its independence until the Second Battle of Kosovo in 1448, June 28 is a day of great significance, not to say sorrow, to Serbian nationalists. In 1914 there was added fuel on that day as Archduke Franz Ferdinand, heir to the Austro-Hungarian empire and all waxed moustaches, feathered helmet and gleaming medals, inspected imperial armed forces in Bosnia and Herzegovina. The annexation of Bosnia in 1908 had outraged Serbian nationalists, who believed the country should have become part of the newly independent and ambitious Serbian nation. 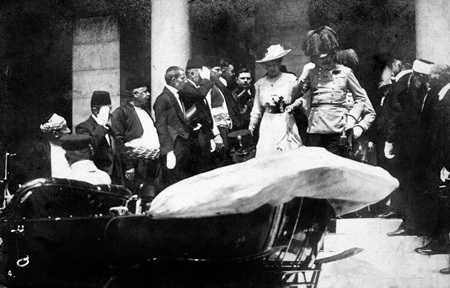 After the inspection, Archduke Franz Ferdinand and his wife Sophie – with minimal security – went to Sarajevo, Bosnia’s capital, to open a museum. June 28 was also Franz Ferdinand’s wedding anniversary and this too has some bearing on why he was in Sarajevo that day. His beloved wife was denied royal status in Austria due to her birth as a poor Czech aristocrat, and their children were treated poorly at court. She could never sit by his side on any public occasion, except in a place where royal etiquette was unclear – a place such as annexed Bosnia. Waiting for the royal pair were six assassins from the Young Bosnia group, which wanted a pan-Serbia (pan-Yugoslavia), all young men who were “walking dead” as they all had tuberculosis. However, the assassins weren’t up to much, missed the royals a couple of times and seemed to lose interest. from the Europeana 1914-1918 collection, via Wikipedia. “We see a pleasant couple on a sunny morning. They are a little plump, perhaps, and well into middle age. Clearly they are people of wealth and consequence. They are sitting in an expensive open car, a rarity at the time. She is elegant in a white dress and hat. Although the photograph is black and white, we know from other sources that the flowers she carries are roses, blood-red ones. He is wearing a military uniform. As she looks on approvingly, he shakes the hand of a local dignitary. “The man leaning down from the car is Archduke Franz Ferdinand, heir to the throne of Austria-Hungary, that vast and ancient empire at the heart of Europe. By his side is his wife, Sophie. As it happens, they are about to celebrate their wedding anniversary. By all accounts the marriage has been a very happy one. Nevertheless, the old emperor and his court disapprove of her because she comes from the wrong social class and they humiliate her at every opportunity. But today Franz Ferdinand and Sophie are in Sarajevo, far from Vienna and its rigid etiquette, and she is being received with full honours as his equal. The assassin is a 19-year-old loitering on a street corner after having given up on the plot. Seeing his chance, Gavrilo Princep steps forward to enter history and for a century afterwards credited with being the tinder that started World War 1. But the tensions in Europe that year were such that the fabric was likely to ignite anyway – and there were plenty of other sparks waiting to fly. On July 28, Austria-Hungary declared war on Serbia, and the tenuous peace between Europe’s great powers collapsed. Within a week, Russia, Belgium, France, Great Britain and Serbia had lined up against Austria-Hungary and Germany, and World War 1 had begun. So what gladness and sadness must have been felt privately and publicly all around the world on the 11th hour of the 11th day of the 11th month in 1918, the first Armistice Day. One of the deadliest conflicts in human history had finally come to an end, leaving more than 16 million people dead and more than 20 million wounded. But grief has a habit of following us down the years – mothers who lost sons and husbands and grieved the rest of their lives, women widowed, women whose husbands returned traumatised (and divorce wasn’t an option), children who lost the men in their lives, women and children who struggled to keep farms and businesses going (it wasn’t until 1916 that the New Zealand government created ‘reserved occupations’ for men), women who remained unmarried, men too damaged to rejoin ‘normal’ life, the abuse of alcohol and the violence. Black-edged letters and telegrams – one from the King and one from the Governor-General – began to be delivered the length and breadth of New Zealand with alarming regularity from the moment of the landing at Gallipoli in Turkey on April 25, 1915. In this year, the centenary of the mess that was Gallipoli, it’s an opportunity to look at the war through a haiku lens, and assess how the form was used during World War 1 and since to bear witness and to remember. In the early years of the 20th century Europe and America couldn’t get enough of Japanese art and culture, even coining a term for the fashion, Japonisme. The fad was tied to the “re-opening” of Japan after the 1853 arrival of American gunboats in Tokyo Bay. Widespread importing – and exporting – once again became possible, and although porcelain had been relatively well known outside Japan during its “closed” years, the country’s refined aesthetics and “exotic” art took the world by storm when it began to arrive en masse. Japan had its own pavilion at the Paris International Exhibition of 1867, the first formal exhibition in Europe of Japanese art. After the exhibition several Japanese art dealers based themselves in Paris, and French collectors, writers, and art critics travelled to Japan in the 1870s and 1880s. 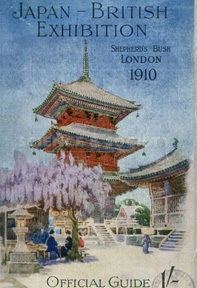 But the largest exhibition in which Japan participated was in 1910 in London – attracting more than 8 million visitors (in 1911 greater London had a population of 7 million) and including more than 2000 artefacts, as well as acrobats, sword dancers, sumo wrestlers and two authentic Japanese gardens.6 The influence of Japanese art was soon evident in fashion, ceramics, glass, furniture, architecture, jewellery and textiles produced throughout Europe, with the impact on the fine arts especially potent. 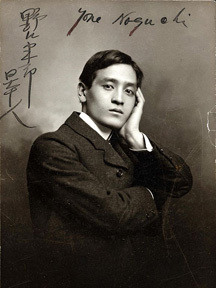 Noguchi eventually became a contributor to Rhythm, the magazine Mansfield co-edited with John Middleton Murry in 1912 – 13, thanks to Mansfield’s influence, “and the influence of Japonisme would be a feature of both her fiction and her personal writing for the rest of her life”. In 1914 Middleton Murry published Noguchi’s The Spirit of Japanese Poetry, largely a collection of lectures he gave in Britain. Mansfield’s family home in Wellington has yielded evidence of the far-flung taste for Japonisme – her father was well-to-do banker Harold Beauchamp (Mansfield was born Kathleen Beauchamp) with a recognised “place” in society. Finds have included a netsuke mouse in porcelain and ceramics, including a piece of a china mug with a design featuring cherry blossom and a bird, “a typical example of Japonisme”.8 The restored building (now a museum) features an interior décor “inspired by Japonisme and the Aesthetic Movement”.9 Mansfield, who had returned to New Zealand from London in 1906, left for good in 1908. The literary arts were, however, one of the lesser strands of Japonisme and apparently didn’t have much of a following outside literary circles. Haiku in Europe: Viva la France! 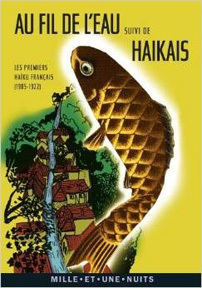 Early, if stilted, translations of haiku and tanka from Japanese into French were available in 1871 and 1885, although were little known outside Japoniste circles.10 Instead, it was the work of Paul-Louis Couchoud, a medical doctor, that saw France in the early years of the 20th century at the forefront of producing haiku poets and understanding the form. Couchoud almost single-handedly drove interest in haiku – and carefully spread the ‘virus’ throughout Europe. He visited Japan in 1903 – 4 and fell in love with the culture, beginning to write haiku and translating Japanese poets, particularly Buson, into French. In 1905 Couchoud and two friends published a limited-edition collection of 72 haiku, Au Fil de l’Eau (Going with the Flow), which they wrote while on a canal holiday. There are several variations of the story behind this book, both on the internet and in print, with different details of the trip, including the names of the other two authors, where the boating holiday took place (France or Japan), and even if it was a boating holiday. Commonsense leads me to believe it took place in France. The French influence – Couchoud’s work in particular – on haiku in Europe cannot be overstated. The enthusiasm for haiku and the understanding of the form radiated out from Paris to Germany, Poland, Romania, Hungary and Britain. People such as Juan Jose Tablada (Mexico/Spain), Ezra Pound (US/Britain), Arno Holz and Rainer-Maria Rilke (both Germany) and Miloš Crnjanski (Yugoslavia) all came into contact with Couchoud or his work and helped spread haiku further. Who wrote the first haiku in English and when is something that in 2016 is impossible to pin down. Theories abound and arguments are made but – even given the debate about what comprises a haiku in English – at this remove the records are simply not there. 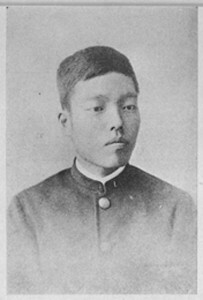 Japanese poet Yone Noguchi (1875 – 1947) lived in the US and England from 1893 to 1914 and in 1902 published The American Diary of a Japanese Girl, the first novel in English by a Japanese, and the first to include an original haiku given both in Romanji Japanese and English, but unlikely to have been composed in English. Tell me the street to Heaven. This? Or that? Oh, which? So this haiku was apparently was composed in Japanese and translated by the author. However, in a 1912 article, reprinted the next year in Rhythm, Noguchi included the following hokku and a description of its composition. In ‘The Unexpected Import’, his thesis on the origins of haiku in English, Brett D Bodemer suggests that Noguchi’s most important contribution to English-language haiku may have been the direct influence his haiku criticism had on American poet Ezra Pound (1885-1972), who arrived in London in 1908 from France. “It may or may not be deemed mere coincidence that the poem often cited as the first published English-language haiku, ‘In a Station of The Metro’, by Ezra Pound, appeared only three months [after Noguchi’s article in Rhythm] … but to my knowledge no one has drawn attention to a rare and identical error of fact, found both in Noguchi’s article and in one written shortly afterward by Pound. Though in earlier and later works Noguchi says the hokku consists of seventeen syllables, in ‘What is a Hokku Poem?’ he refers to it as being made of sixteen syllables. 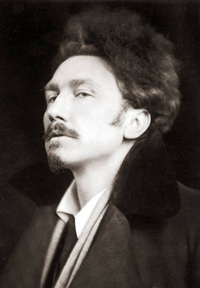 And so does Ezra Pound in ‘How I Began’, an article that appeared in June of 1913. In September 1914 Pound offers another genesis of his ‘Metro’ poem, Bodemer continues, this time referring to it as a “hokku-like sentence”. Both the poem and Pound’s description make it clear that he recognises the principle of association as earlier explained by Noguchi. Pound had written his “In a Station at the Metro” poem by 191123 with publication in 1913 in Poetry magazine. It is often considered to be the first haiku written in English, although one might consider Noguchi to have a better claim, whatever the quality of either piece. 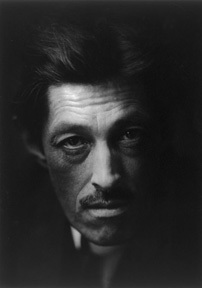 Pound was also being introduced to the art of the Far East through the 1909 lectures of poet Laurence Binyon and to haiku through Imagist F S Flint (1885 – 1960), the latter inspired by the writing of Couchoud. Another with a claim to having composed the first haiku in English is the larger-than-life half-German half-Japanese (Carl) Sadakichi Hartmann (1867 – 1944). Hartmann made four long visits to Europe where he was taken up by the bohemian set, sending journalism and art criticism back to America. He is mentioned in Pound’s writing several times. Hartmann included several tanka in his 1904 book of poetry, Drifting Flowers of the Sea, and in 1915 published his Tanka and Haikai. Hartmann reworked and reissued these images for much of his life. What else is life’s dream! Jim Kacian, in a 2005 essay,32 describes Hartmann’s haiku as “truly poetic renderings”. Two weeks I’ve waited in vain. Lining up on one side in World War 1 as the “Allies’ were countries including Russia (taking in Finland and part of Poland), France (and its colonies), Japan, and the United Kingdom, whose colonies and dominions included Canada, Newfoundland (at the time not part of the dominion of Canada), Australia, New Zealand, India, Kenya and South Africa. Italy (and its colonies) entered the war in 1915, Portugal (and its colonies, although fighting was taking place in Africa in 1915) and Romania in 1916, and the United States, Greece, China and Brazil in 1917. Japan secured sea lanes in the Pacific and quickly occupied Germany’s lease territories in east Asia and colonies in the Pacific, while its naval vessels were also stationed in Cape Town and Malta. On the other side was the ‘Central Powers’ – the German empire (including part of the Jutland Peninsula that is today Denmark and part of Poland) and its colonies, Austria-Hungary (including what later became Yugoslavia and Czechoslovakia) and the Ottoman Empire, with Bulgaria entering the war in 1915. In 1913 the Ottoman Empire comprised what is today Turkey, Lebanon, Israel, Palestine, Jordan, south to Saudi Arabia and Yemen, plus Syria, Iraq and Kuwait. By the start of World War 1 it had lost its eastern European lands, including Bulgaria which had been occupied for almost 500 years. — Kaiser Wilhelm II, watching German troops march off to war in August, 1914. And now we were passing big wooden sheds like rigged-up dancing halls or seaside pavilions, each flying a flag. In and out of them walked the Red Cross men; the wounded sat against the wall sunning themselves. At all the bridges, the crossings, the stations, a petit soldat, all boots and bayonet. Forlorn and desolate he looked, like a little comic picture waiting for the joke to be written underneath. Is there really such a thing as war? Are all these laughing voices really going to the war? 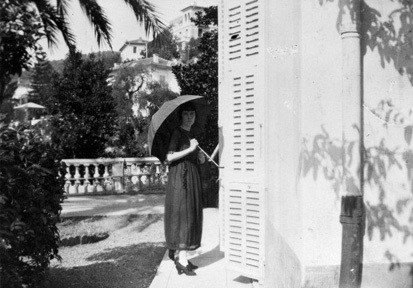 Katherine Mansfield, with a parasol, at the door on to the terrace at the Villa Isola Bella, Menton, France. Photograph taken by Ida Baker in 1920. Collections of the Alexander Turnbull Library. Mansfield’s much-loved younger (and only) brother Leslie Heron Beauchamp (Chummie) joined the South Lancashire Regiment and was a 21-year-old Second Lieutenant when he was killed by a malfunctioning hand grenade during training on October 6, 1915. He is buried in the Messines war cemetery in Belgium. Chummie had just spent two weeks with Mansfield and Middleton Murry in London while on an army course, ironically, on the use of hand grenades, and had met his sister as soon as he had arrived in London in February 1915 – she borrowed money from him to make her trip to Carco in France. Chummie’s death had a significant impact on Mansfield’s writing, unleashing memories of New Zealand and their shared childhood, which she turned into some of her best work,35 including Prelude, the time before his birth in February 1894, and its sequel, At the Bay. French poet Julien Vocance (1878 – 1954), born Joseph Seguin, had been introduced to haiku by Couchoud. When war was declared Vocance enlisted in the French army and, while serving in the trenches, wrote Cent visions de guerre (One Hundred Visions of War),36 the title a sardonic play on One Hundred Views of Edo, Hiroshige’s famous series of woodblock prints, or One Hundred Views of Mt Fuji by the artist Hokusai, or both. In 1917 Vocance published another ninety war haiku in La Grande Revue. Cheshire regiment, The Somme, July 1916. Image: Wikipedia. The Italian poet Giuseppe Ungaretti (1888 – 1970) included haiku about his war experiences in the collection, The Buried Seaport/The War. He had been in Paris before the war and “undoubtedly” knew Couchoud’s book, Hokenson says, adding that Ungaretti began keeping a diary in haiku and eventually wrote ‘haiku-like’ forms of his own invention. 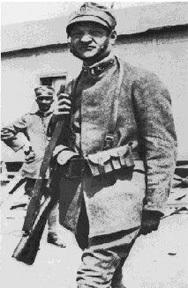 Giuseppe Ungaretti in Italian infantry uniform during World War 1. Image: Wikimedia. A rough translation, Wilmer says, would be: “I flood myself with the light of the immense”, though the vagueness of that is alien to the poem’s terse musicality. The open vowels and the repeated ms and ns create a mood of wonder, evoking the light of a new day starting to flood the sky. Umberto Saba (1883 – 1957) was born in Trieste, then the fourth-largest city in the Austria-Hungary empire. Destitute, in 1914 he and his wife and young family moved to Milan, where Saba worked first as a secretary, then as a nightclub manager. In early 1915 he began writing for Benito Mussolini’s Il popolo d’Italia newspaper, but in June was drafted into the Italian army. He was hospitalised with depression, an illness that dogged him all his life, and saw no active service. in his free hand carrying a bundle. Rene Maublanc (1891 – 1960), a French Marxist historian and teacher, wrote many haiku, his major work being Cent Haikais (100 Haiku, published in 1924). Although I can find no record of his having served in World War 1, a number of his haiku are about the war. Ouvre et ferme son éventail. Maublanc, a friend of Couchoud, lived in Reims where he started a regional review of literature and art, Le Pampre, which Agostini says was instrumental in propagating haiku among French speakers. Aldington enlisted in the British Army in 1916 and was wounded on the Western Front. By the end of the war he had a captain’s commission, had been gassed and was suffering from severe shell-shock. Watching the cold rainy dawn. As a footnote to this section are the wartime experiences of two other figures who later came into the orbit of haiku, one in a peripheral way and the other a major scholar. American poet, playwright, novelist and painter ee cummings (Edward Estlin Cummings, 1894 – 1962), briefly dabbled in haiku. A pacifist, Cummings volunteered as an ambulance driver in France in 1917 but was arrested on suspicion of treason for comments he’d made in letters home and was interned in France for almost four months. The charges were dropped (after some political pressure from his father) and he returned to the US on January 1, 1918 whereupon he was drafted into the US Army, serving at home. His account of his time in the internment camp, The Enormous Room, was published in 1922 to widespread praise. Reginald Horace Blyth (1898 – 1964), later a renowned translator of haiku and author on the subject, was in 1916 imprisoned as a conscientious objector at Wormwood Scrubs in London before working on a Home Office scheme in the former and future Dartmoor Prison in southeast England. He moved to Korea (then under Japanese rule) in 1925 and to Japan in 1936, living there for the rest of his life. In the teen years of the 20th century in Japan haiku was in upheaval after the death of Masaoka Shiki in 1902, the man who had done so much to reform and revitalise haiku, but who had also written that he thought “haiku has already played itself out”, adding an emphasis to the words. Kawahigashi Hekigodo (1873 – 1937) succeeded Shiki as haiku editor for Nippon newspaper and was, briefly, the most important figure in Japanese haiku. One of Shiki’s innovations had been to abandon all the rules for haiku – except for 5-7-5 and the season word. Hekigodo then decided to drop the count of 17 onji (sound units) in favour of “free verse” haiku. He retained the kigo because he felt it was an essential connection to the natural world. for those brought back as bones? After the war the term ‘commoner literature’ was again applied to haiku, although in a positive sense, according to Robert Tuck.64 “Scholar Haga Yaichi’s preface to Iwaki Juntarō’s Meiji bungakushi (A History of Meiji Literature, published in 1906) states that ‘commoner literature’ (which included haikai) had played an instrumental role in spreading the ‘Bushidō’ and ‘patriotism’ that had contributed to Japan’s victory. “The death of [the legendary military leader] Yoshitsune was as spectacular as his life. He calmly committed seppuku (samurai ritual suicide) while his oldest friend, the giant warrior-monk Benkei (Japan’s ‘Little John’) single-handedly held the door against an overwhelming number of enemy troops. The place where Benkei and Yoshitsune made their final stand was Hiraizumi, and it was here that Bashō composed a number of haiku, including the one above. “Bashō is believed to have chosen the Japanese word ‘natsukusa’, in reference to the muggy, slimy, rank muck that summer’s oppressive humidity and heat turn the grasses of spring into, an appropriate vision, perhaps, of the chaos and treachery of war. By the time Basho visited Hiraizumi centuries later, those dank overgrown weeds were all that remained of the fortress in which Yoshitsune made his final stand. With more than 4,600 “German” soldiers interned in Japan after being captured in China during World War 1,67 it is an intriguing thought that haiku could have been a “mass inoculation” into Germany and eastern Europe after the war – especially as it seems cultural exchange went the other way with locals being shown how to bake bread, make pastries and sausages, play soccer, brew beer, etc.68 Most of the POWs remained in Japan for 5 years and it is reported that some 500 chose not to return to Europe, instead heading to China and Indonesia with some 150 staying in Japan.69 The prisoners consisted of not only soldiers from Germany and the Austro-Hungarian empire, but also Czechs, Slovakians, Poles, Yugoslavians, some northern Italians and even Russians (Russia and Japan were part of the Allies). On April 25, 1915 New Zealand and Australian soldiers landed at a small bay on the Gallipoli peninsula in southwestern Turkey to mount a campaign devised by Winston Churchill that began badly and continued worse.70 By the end of the year evacuation was ordered, ironically efficient and organised – and not one man lost. The smell of death floated over the ridge above and settled down upon us, tangible, it seemed, and clammy as the membrane of a bat’s wing. 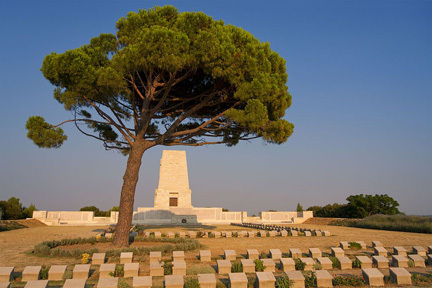 Lone Pine cemetery and memorial, Gallipoli. Image: Wikipedia. But lest we forget there were other nationalities fighting at Gallipoli too and their blood has also fed that barren land – 21,255 dead from Britain and Ireland and 52,230 wounded; 10,000 dead from France, 17,000 wounded; 1358 dead from India, 3421 wounded; 49 dead from Newfoundland, 93 wounded. You, the mothers, who sent their sons from far away countries wipe away your tears; your sons are now lying in our bosom and are in peace. After having lost their lives on this land they have become our sons as well. In New Zealand there is a tendency to see the Anzac landing at Gallipoli – which on April 25, 2015 marked its centenary – as the most important battle for our soldiers in World War 1. But Gallipoli was blighted by poor command and ended in defeat, and isn’t regarded as a major offensive by military historians. 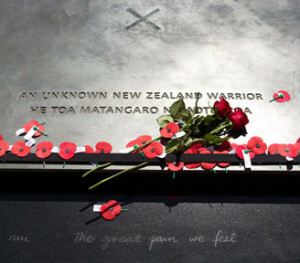 Tomb of the Unknown Warrior, National War Memorial Pukeahu, Wellington, New Zealand. Image: Andy Palmer, Manatū Taonga (Ministry of Culture and Heritage website). 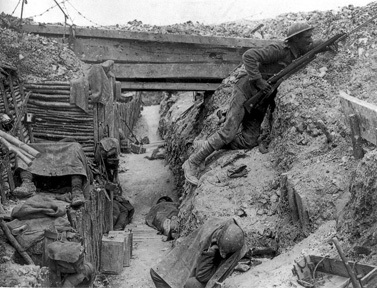 The Great War inspired much poetry both from poets and from men who were simply touched by the shock and awe – and a century later we still know the lines. With haiku relatively unknown in the English-speaking world at the time, it has been left to modern haiku poets to write on the theme of World War 1 with, consequently, most of the poetry in New Zealand about memorial services, particularly Anzac Day (April 25). The country’s national day of commemoration now encompasses all servicemen and women from the Boer War to Afghanistan and Iraq and so haiku about “Anzac Day” may be about any or all of these conflicts – but as our “old soldiers” fade away the sentiments and experiences remain largely the same through the generations. As far as I am aware, Ernest J Berry is New Zealand’s only haiku poet with personal experience of war, having served in Korea as a medic (1950 – 53). 162 Haiku: a Korean War sequence features haibun and haiku by Ernie, with a contribution from American poet and fellow Korean War veteran Jerry Kilbride (Post Pressed, Australia, 2000). The book was awarded third place in the 2001 Haiku Society of America Merit Book Awards. Both these haiku are from that book. If we like to believe that our national identity was forged on the battlefields of World War 1, particularly Gallipoli, then I suppose that’s as good a place as any. It’s where, at the very least, this most docile of dominions began to question orders. By now wounded men by the score were being brought back and laid along the track, all sorts of wounds. The stretcher bearers couldn’t cope with the number and soon there were no stretchers. I got an immediate demand from [Australian] Colonel Braund for more reinforcements but sent him a firm refusal. He then said as I would not send him up more reinforcements he would have to retire to his first position. I told him he never ought to have left it. Postscript: What Happened to Haiku in English? In his essay ‘Tanka, Imagism and War’, John Gilliver85 writes that tanka (and we can safely read haiku here as well) did not get into quite the right hands in England and the US before 1914 and so was not sufficiently assimilated for an English tradition to be produced. As the world recovered from war, as millions of people died from “Spanish flu” (1918 – 19, anything from 20 million to 40 million), as the Depression took hold and, finally, as Japan became an enemy to the English-speaking world, the path of haiku in English began to stutter and then vanish, hidden like a Brigadoon until after World War 2.